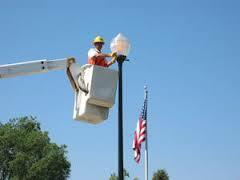 To report a street light in need of repair, you may email Ameren at StreetlightrequestIL@ameren.com. If the repairs have not been made after three days, please call the Mt. Zion Police Department at (217) 864-4012 or Village Hall at (217) 864-5424.